Yikes! I was writing the title for this post when it hit me. “Today isn’t Wednesday, is it?” I asked daughter. “Nope,” she answered, unaware that I was really serious. Had I really gone through the entire day acting as though it were Wednesday? Thinking about the work day, I do recall knowing it was Tuesday, mostly because a regular weekly got canceled. That’s always nice (IMO); it means an extra hour to get real work done. Yes, I know meetings are needed and even can be useful, but not having one always means the work gets done sooner. 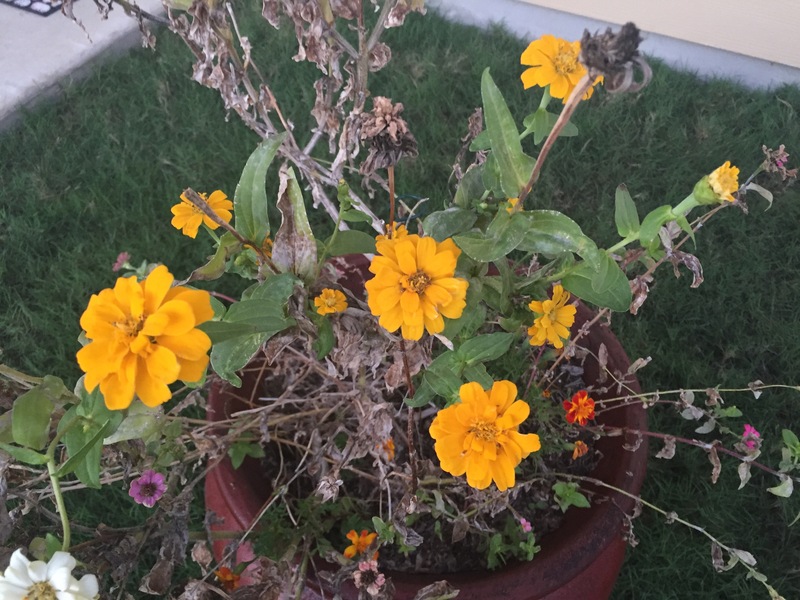 I wanted to write something short (hence the “almost wordless”) about how surprised I was to see the yellow zinnias popping up on the otherwise dead stalks. Another reason for me not to kick myself for forgetting to clean out the containers over the weekend. Because then I wouldn’t get to admire the bright, beautiful petals. What a great way to end this lovely Wed…, er, I mean Tuesday!